Signage is up for a Indian restaurant called Cinnamon Garden on Sixth Street between First Avenue and Second Avenue... promising "authentic Indian cuisine." The restaurant has a website (here!) with a menu — and prices. There isn't much info on the site about who will be operating Cinnamon Garden, other than this line: "From an outstanding chef with amazing taste." This will be the fifth restaurant to serve Indian food on this block, joining Apna Masala, Raj Mahal, Malai Marke and Taj. 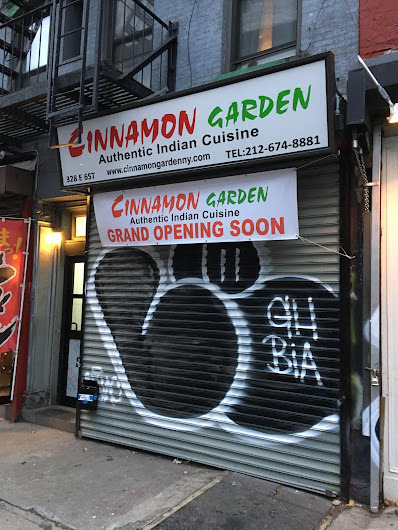 For further reading ... this piece from 2016 by Robert Sietsema at Eater has some history on the Indian-Bangladeshi restaurants that have populated this block and adjacent Avenues through the years. If they don't have sitar and tabla in the window I'm not going. Another week on EV Grieve with announcements of restaurants opening and closing. For all the talk by regular posters here about a neighborhood, it seems that the "nab" is defined by food and coffee outlets. The dream world of small businesses offering something unique seems to be just that a dream. We might as well face it, the EV is like every other neighborhood in NYC, businesses exist to serve the needs of the immediate community--and in the case of the EV it means the I don't cook anymore (except on rare occasions) community. Best of luck to all of these new restaurants (I am one of those who cook regularly so I won't be a patron). Cinnamon Garden? What an awful name for a restaurant. welcome, small biz! i am interested! @7:46 am, i think that block of 6th street IS unique! the prices here look reasonable, and who knows, maybe the chef IS outstanding! fingers crossed! I'm happy to see an Indian restaurant opening on Indian row. I was walking down the block the other night and was sad to count the disappearing number of Indian restaurants. I have memories of so many that aren't there any more. You can never have enough Indian restuarants. Also interested. I have had Mughlai a few too many times now, and need a change. I find Taste of Calcutta or Heart of India a bit inconsistent, and Brick Lane just comically over priced. So welcome CG. I agree with Anon. 8.02, terrible name, but also with all the other posters cheering the fact that an Indian restaurant is coming back to 6th Street where it belongs. I'll definitely check them out. Kudos to 7:46 AM for speaking the truth. It won't be well received by those still clinging bitterly to their "my beloved city!" / "those were the good old days" rhetoric. What Indian restaurants on 6th do people like nowadays? I was a raj mahal loyalist but the last two times I’ve ordered the chicken has been so disgusting I had to throw it out. @1:07pm - Malai Marke is excellent, probably the best of the bunch. It costs a bit more, but is worth it. @7:46 - it is possible to cook and go out once in a while, especially for cheap Indian food. @12:58 - you make no sense. Look at the comments here. Maybe you two should get together for a nice meal. I am truly shocked and pleased that a new Indian restaurant is opening where so many have closed. Have we heard anything new about Haveli, which was supposed to be looking for a new location? Hopefully they are staying right where they are, and Little Indai will rise again. In the meantime, we welcome Cinnamon Garden, or CG’s for those who prefer brevity. The old Shah Bagh used to include a cinnamon stick in every plate of rice, and it was delicious. Raj Mahal's food goes up and down but they're my favorite and they still have live music. @11:41 - Unfortunately, Heart of India is very consistent now: it closed. I always liked their dosa (& haven't found a new neighborhood spot for that), even though the carpet in the place seemed kinda disgusting. Cant wait. I LOVE Indian food and very much miss the lunch specials. Knew the block when it was wall to wall south asian cuisine. Used to be regular of Raj Mahal but the service is now bad- chicken burned - charred- yet they wouldnt replace it. Lunch gets you very little now- half of what it used to and the chutneys look like they'd been recycled off everyone else's tables. Ugh. Haveli very expensive- $40 bucks for a dinner and then they forgot the appetizer, soup and sent wrong chick entre'. Malai Markee has a good lunch special for $11.95. I usually get the lamb mirchiwala and might boost it at home with some spinach. Speaking of which, Motorino and Hot Kitchen also have good lunch specials.